All life on Earth came from one common ancestor - a single-celled organism - but what it looked like, how it lived and how it evolved into today's modern cells is a four billion year old mystery being solved by researchers at UCL using mathematical modelling. The leakiness of the membrane allowed LUCA to be powered by energy in its surroundings, most likely vents deep on the ocean floor, whilst holding in all the other components necessary for life. The team modelled how the membrane changed, enabling LUCA's descendants to move to new, more challenging environments and evolve into two distinct types of single-celled organism, bacteria and archaea, creating the deepest branch of the tree of life. Bacteria and archaea share many common features such as genes, proteins and mechanisms of reading DNA, initially leading scientists to believe they were just different types of bacteria. Their classification changed in the 1970's after extreme differences were found in the way they replicate DNA and in the structure of their cell membrane. As they both stemmed from LUCA, scientists set out to find answers in the structure and function of LUCA's membrane. I find this work just beautiful - it constrains a sequence of steps going from the strange cell that seems to have been the ancestor of all life today, right through to the deep division between modern cells. From a single basic idea, the model can explain the fundamental differences between bacteria and archaea. Is it right? I'd like to think so, but more importantly, it makes some clear predictions that we plan to test in the future. Dr Nick Lane (UCL Biosciences) who led the study said, "I find this work just beautiful - it constrains a sequence of steps going from the strange cell that seems to have been the ancestor of all life today, right through to the deep division between modern cells. From a single basic idea, the model can explain the fundamental differences between bacteria and archaea. Is it right? I'd like to think so, but more importantly, it makes some clear predictions that we plan to test in the future." Data from the study strongly suggest that LUCA lived in the area where ancient seawater, dense with positively charged particles called protons, mixed with warm alkaline vent fluid, which contained few protons. The difference in the concentration of protons across these two environments enabled protons to flow into the cell, driving the production of a molecule called adenosine triphosphate (ATP) which powered the growth of cells, just as it does today. However, unlike modern cells the scientists believe this could only happen if the membrane was 'leaky', enabling protons to leave the cell spontaneously so more protons could enter to power growth. 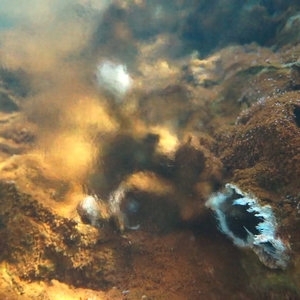 Dr Lane said: "In these deep sea vents, there is a continuous flow of alkaline fluids, which mix with the ocean waters. When they mix, the fluids neutralise each other, and that stops any build-up of charge which would otherwise prevent protons flowing into the cell. If the first cells had leaky membranes, then protons could enter and then be neutralised, or leave again, almost as if there was no barrier at all. What we've shown is that the rate at which protons enter and leave is high enough to power the growth of cells via proteins embedded in the membrane. So LUCA could have been powered by natural proton gradients in vents, but only if it had a really leaky membrane, completely unlike today's cells." To escape from these seabed vents, LUCA had to adapt its membrane to pump protons out of the cell, in order for them to flow back in again to help drive ATP production. The study suggests that the bacteria and archaea developed completely different cell membrane structures and proton pumps, whilst keeping the same machinery for powering growth. It also explains why they differ in fundamental traits that depend on the membrane such as DNA replication. Victor Sojo (UCL CoMPLEX/Biosciences), first author of the study, said: "Exploiting gradients is universal across all life, but understanding how LUCA used one to drive growth gave us a bit of a chicken-and-egg problem: LUCA wouldn't make a gradient if it didn't know how to exploit it, but how could it learn how to exploit a gradient if it didn't make one in the first place? We propose that natural proton gradients provide a solution because LUCA didn't have to make the gradient; it was already there for free. We show that modern 'non-leaky' membranes had to evolve later, and they did so independently in archaea and bacteria. This explains why membrane bioenergetics are universal in archaea and bacteria yet ion pumps and membranes are different, which has been the big unknown." For their next project, Dr Lane and his team hope to recreate the environment of the vents, which are believed to have been where the building blocks of life spontaneously formed four billion years ago, to gain further insight into how molecules behave and interact in such conditions.